Idli is a popular South Indian breakfast recipe which needs no introduction. Idli served along with sambar and chutney is one my favorite breakfast recipes. I had posted a perfect idli recipe few months back and hope you all tried as well. I got many positive feedbacks for that recipe and I am very happy to hear such comments from you all. 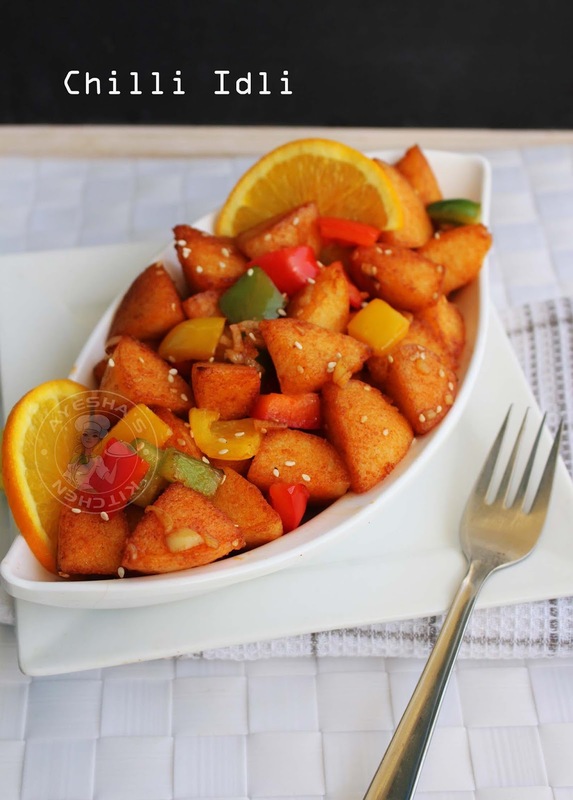 Ok. Today, am going to share a yummy snack recipe with leftover idlis. 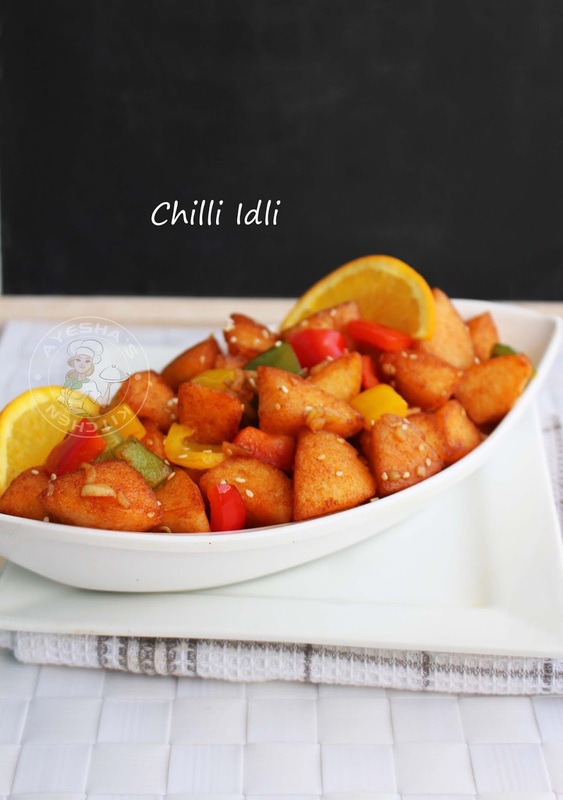 Chilli idli, the name itself makes you drool. right? Sometimes, I make idlis at home just for preparing this snack. Kids love this snack for sure. 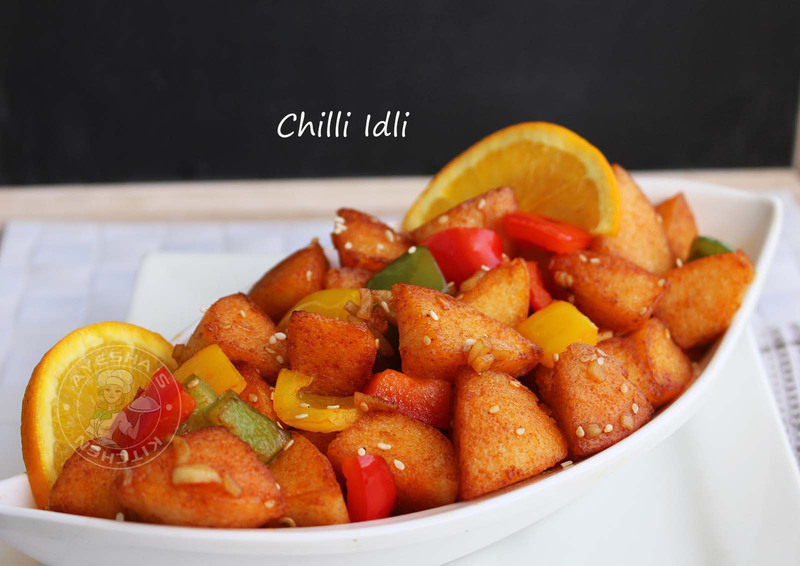 If you are making this snack recipe with fresh idlis, then you have to refrigerate it at least for an hour. I know deep fried idlis are not healthy. So if you are more concerned about your health, then go for a shallow fry method. Apart from making chili idli recipe with leftover idlis, you can also make upma, finger fries with idlis like so. So let us move to the recipe showing how to make chilli idli/ leftover idli recipe/ fried idli/ snacks recipes/ kids snacks/ spicy snacks/ easy snack with idli. 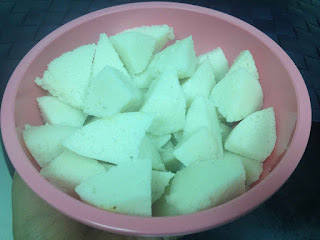 Cut the idlis into small cubes or bite sized long pieces. For best results, refrigerate freshly prepared idlis for an hour for this recipe. I used leftover idli for this recipe. Sprinkle quarter tsp of chili powder over these cubed idlis and mix well. Heat oil in a kadai or pan for deep frying. Once hot, deep fry the idlis. Fry until golden and then drain it to a tissue paper. Now heat 2 tsp of oil in a pan. Saute chopped garlic and white sesame seeds for a while. Mix together tomato sauce and soy sauce in a bowl. Add this sauce to the pan. Saute well for few seconds. Then add the fried idlis and chopped bell peppers. Mix very well and check for salt. Let it cook for a minute and switch off the flame.